The word Scribe spelled using colorful squares representing elements from the periodic table. This is cute, original design for anyone that loves writing, blogging or keeping More... a journal - especially if they also love science or chemistry! 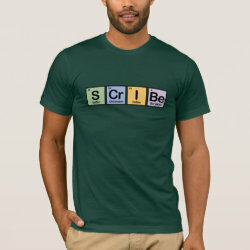 Sulfur + Chromium + Iodine + Beryllium = SCrIBe You can customize this gift! Move the design around, change the background color or style, add text or images -- make it your own!